Note from March 27, 2019: The features and services described in this post have changed since the post was published and the procedures described might be out of date and no longer accurate. Specifically, the procedures have not been tested with ADFS 4.0. If we update this post or create a replacement, we’ll add a notification about it here. Note: Active Directory Federation Services (AD FS) 3.0 uses form-based authentication by default. If you are using AD FS 3.0 in this configuration, use the solution presented in this post. In this blog post, I’ll show you how to extend my previous implementation to use form-based authentication, which is supported by nearly all Identity Providers (IdPs). 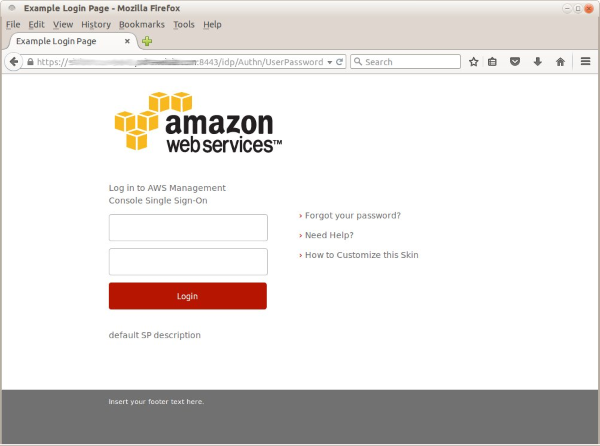 Already integrated your IdP with your AWS account for single sign-on (SSO) console access. If you need help getting up to this point, see this documentation, which includes links to a number of installation guides for common IdPs. Note: If you don’t yet have a SAML IdP, check out Single Sign-On: Integrating AWS, OpenLDAP, and Shibboleth to get started. Enabled form-based authentication within your IdP configuration. During form-based authentication, the IdP presents the user with an HTML login form in which they enter their user name and password. Read my earlier post and completed all the “Getting started” steps. The majority of the integration is identical, and this post will focus only on the specific differences between NTLM-based authentication and form-based authentication. Downloaded either the new form-based authentication version of the script or the AD FS 3.0-specific version of the script. In order to get started, you’ll need to know the IdP-initiated login URL. This is simply the URL that you are currently using for SSO access to the AWS Management Console. As an example, I’m using Shibboleth 2.x where the IdP-initiated login URL takes the form of: https://<fqdn>:<port>/idp/profile/SAML2/Unsolicited/SSO?providerId=urn:amazon:webservices. If I place this URL in my browser’s address field, I’m presented with the IdP login page, as shown in the following image. You will notice that before the login page is displayed, the IdP has issued a number of HTTP redirects in the background. After this process, the URL shown in the toolbar is different from the one that initiated the process. Make sure you have the original IdP-initiated login URL, and enter it in the new script as the idpentryurl. In the new script, you will notice the following section, which is for the form-based authentication implementation. This code uses the Python requests module to initiate the IdP connection and follow all of the HTTP redirects to the IdP login page. The resulting login page is then parsed using BeautifulSoup in two ways. First, all of the input fields are captured and populated with the values from the generated form. During this process, the code determines where to inject the username and password provided by the user. Second, if present, the form action is captured as the idpauthformsubmiturl so that the code knows where to submit the form. With the parameter payload assembled, the final step posts the parameter payload back to the IdP. If the authentication is successful, the response will include the SAML authentication response necessary to request temporary security credentials from the AWS Security Token Service (STS). This enables the presentation of the “happy path” in a cleaner and more compact fashion that can be understood and explained with relative ease. I want it to be very clear that this is proof-of-concept code that requires adaptation before real use. However, upon further reflection, there is one check that I should have left in to handle the most basic error condition—incorrect credentials. Locate the following section of the new script. # Better error handling is required for production use. This error-handling snippet highlights a challenge with this approach—the IdP returns a HTTP 200 success code regardless of whether or not the authentication was successful. Any descriptive error message coming back from the IdP is embedded in the HTML and will need to be parsed out. The new script produces the following output. Your new access key pair has been stored in the AWS configuration file /home/janedoe/.aws/credentials under the saml profile. Note that it will expire at 2015-07-16T17:16:20Z. To use this credential, call the AWS CLI with the --profile option (e.g., aws --profile saml ec2 describe-instances). The script prompts a federated user to enter credentials (user name/password). These credentials are used to securely authenticate and authorize the user against the configured IdP. The script inspects the returned SAML authentication response and determines the AWS Identity and Access Management (IAM) roles the user has been authorized to assume. After she selects the desired role, the script uses AWS STS to retrieve temporary security credentials. The utility automatically writes these credentials to the user’s local AWS credentials file, and she can begin issuing AWS API or CLI calls. If you need guidance about how to reference the SAML profile in the various AWS SDKs, I’d suggest A New and Standardized Way to Manage Credentials in the AWS SDKs. If you are having trouble getting things working, there are a couple of areas to focus on first. Most notably, the new script makes presumptions about the names of the fields that store the username and password. If you inspect the HTML of the IdP login page from your browser and see that these fields are named otherwise, replace the string user or pass in the code to match. You can also uncomment the print payload line temporarily to test that things are populating correctly. You might also find that your IdP tries different authentication mechanisms (e.g., Kerberos) first and then falls back to form-based authentication. Depending on the specific implementation of such a fallback, you might have to do some additional inspection and parsing of the flow to arrive at the proper IdP login page. If you suspect this might be the case, additional print statements, such as print formresponse.text.decode(‘utf8’) are a good simple debugging tool to figure out what’s going on. The code presented in this post has been developed over time while working with a wide range of different AWS customers and IdPs. In most cases, while not as elegant as a tightly integrated API-based approach, the code’s beauty lies in the fact that it rarely needs further modification beyond setting the proper IdP-initiated login URL. Having said that, I haven’t had the opportunity to work with every IdP out there. If you have any issues with the implementation, please post a comment below with the relevant details, and I’ll make every possible effort to extend the solution appropriately. I hope you enjoyed this post, and I look forward to your continued feedback and tales of success using this solution.